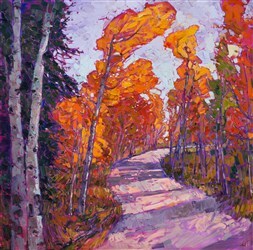 Erin Hanson has long been fascinated by the endless color variations found in nature. 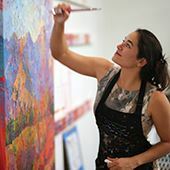 She has spent her life working to capture the intense colors produced during different times of day in a variety of terrains and locales. 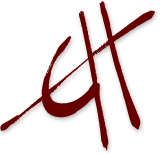 If you have had the opportunity to browse her portfolio, you will see that she focuses on capturing the play of light and depth of shadow found in landscapes across the western United States. 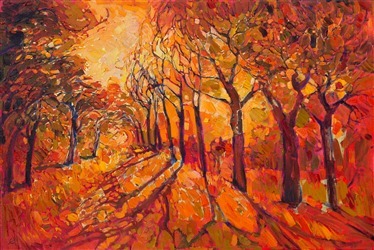 Many of her past paintings have shown a predominance of greens, blues, and reds; rarely has she ventured exclusively into the many shades of oranges. 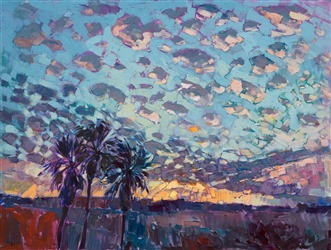 The spray of dying light cast across the sky by a setting sun is a scene many artists have tried to capture across the world. 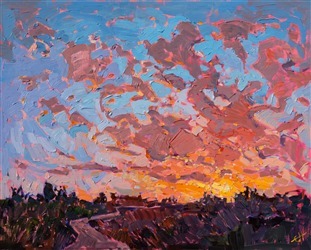 Erin Hanson recreates sunset across a Southern California sky in Streak of Orange, using her signature impressionistic style. Many of us miss dawn. We may sleep through this unique time of day or already be fast at work as the sun lightens our sky. Though dawn is rarely seen, it is well known as a distinctive time of day when the sun first peaks into the world, creating intense colors for only a few moments. 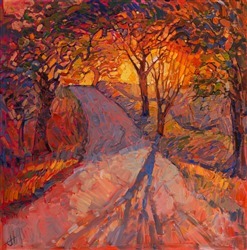 Gilded Path captures the fiery intensity of dawn with more than paint. 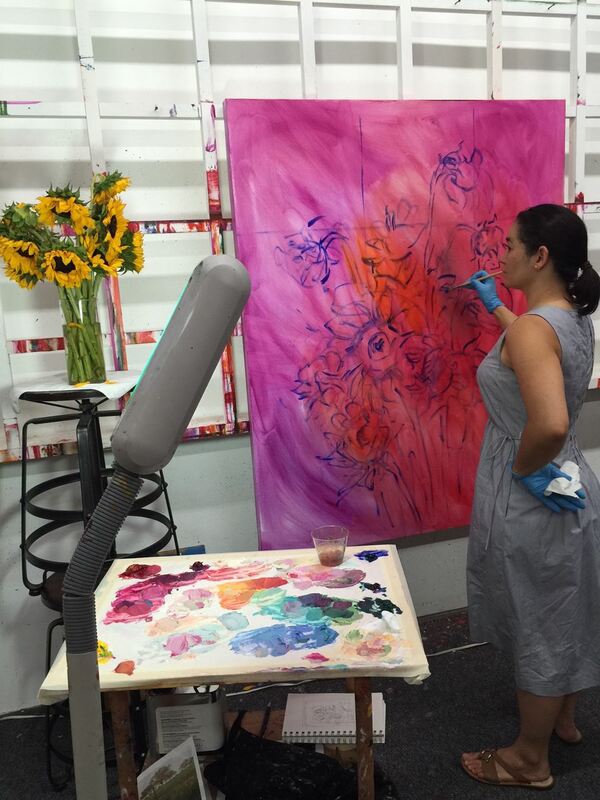 Erin has applied 24kt gold leaf to the underpainting, using the light of the present to recreate the shimmering golden rays that hit the world on the morning captured in Gilded Path. Autumn leaves are the ideal subject for anyone wishing to find fiery reds and bright oranges in nature. Shaded Breeze depicts Jack Frost’s first touch upon a tree-lined lane in Southern Utah. Thick, impressionistic brush strokes capture a summer dawn in Paso Robles. There is something energetic about the light Erin depicts in this modern impressionist painting – the intense light that begins a brand new day. 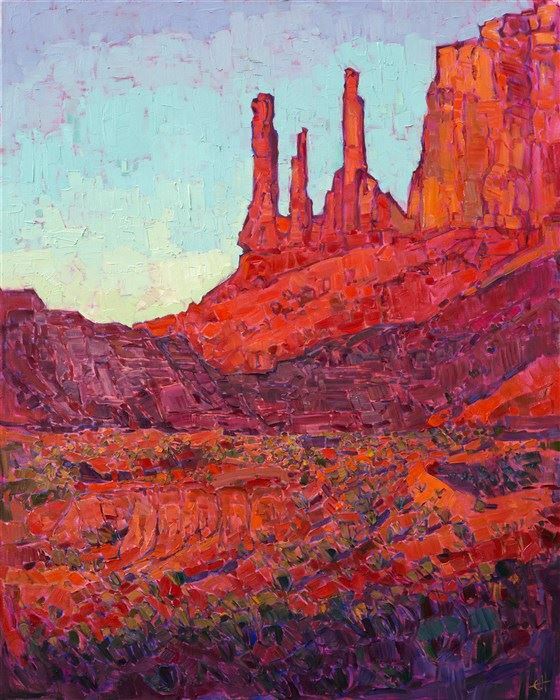 Anyone who has experienced the majesty of the Grand Canyon will have the opportunity to re-experience that feeling at Erin Hanson’s Orange Show. 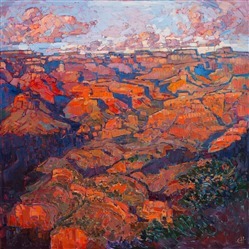 Grand Canyon in Orange depicts the awe-inspiring vistas, intense colors, and raw beauty represented by one of our nation’s most spectacular national treasures. Autumn progresses through many shades. As the year progresses towards its close, the trees begin to turn: autumn leaves contrasting against green summer leaves. As autumn moves forward, there is a very short time that may only last for a few days when every single tree boasts vibrant tangerine, gold, amber, and fiery colors. Aspens and Pine captures that apex of autumn and contrasts it with the evergreen colors of pine. Sunsets are different across the globe. 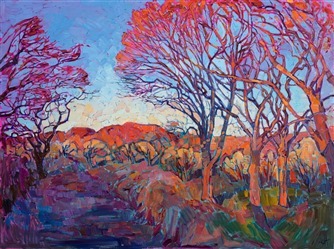 In Winter Orange, Erin Hanson captures the cerulean sky of the Northwest as it gradually turns rosy and golden. Winter in Utah is often harsh and frigid. However, that clear, clean light sets bare branches on fire as the sun falls behind the red rock cliffs of St. George in Radiant Orange. The view of California’s wine country in summer is often row upon row of green, fruitful vines. 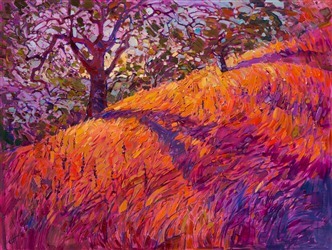 Erin Hanson steps past the vineyards and into the natural landscape of Paso Robles in Adeliada Orange. Here, she catches early morning light cast over the golden grass, creating a unique combination of light and shadow. 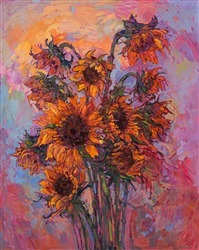 Sunflowers are a simple summer flower that engulf the essence of the season. They grow wild throughout Southern California, brightening up dusty roads and lifting the spirits of hikers as they wander the hills and mountains throughout the state. 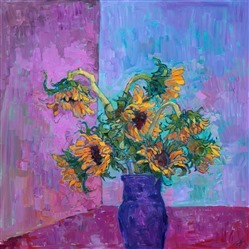 Erin has her own relationship with floral still lifes and became energized at the prospect of painting sunflowers in honor of the Orange Show. California sunsets are said to be some of the most beautiful in the world. Citrus Hills captures Northern California as the sun sets the world on fire with each dying ray, creating a luminous landscape of crimson, gold, and every color in between. 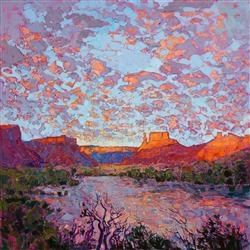 Following the Colorado River in January, Erin Hanson discovered a vista of rock and river that both captured and reflected the brilliance of the rising sun. Light plays across every part of North of Arches, reawakening the cold, bright beauty of a winter dawn. 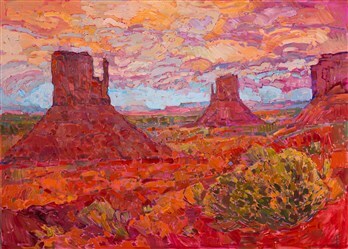 Erin captures the red-sand desert of Monument Valley in cadmium, ginger, and crimson in Monument in Orange. The stunning vistas of this Navajo Tribal Park are backdropped by a sapphire sky. 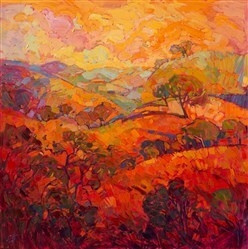 Even Southern California experiences the beauty and vibrancy of autumn, as shown in Autumn Orange. 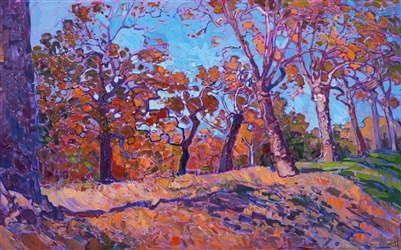 California sycamores rise up in celebration of the crisp air, clear light, and intense hues of the season. The raw beauty of Arches National Park is captured in Fins at Dawn. This painting includes every shade from wine to apricot, showing how the natural progression of light changes red sandstone into something even more spectacular. 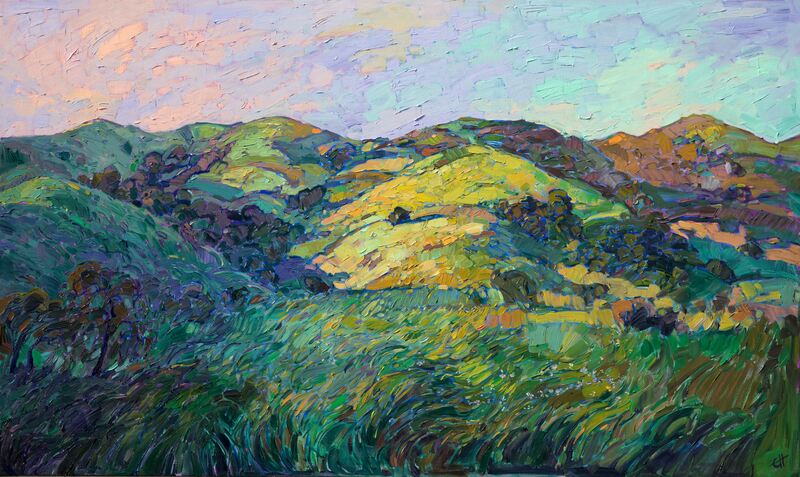 Erin Hanson shows us the golden hills of California, dotted with green oak trees as the day begins in Paso Robles. 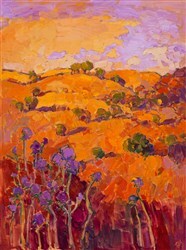 Erin Hanson: The Orange Show is complete at eighteen paintings. 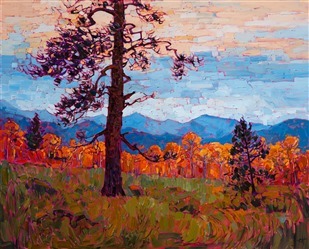 Be sure to celebrate the season with us by visiting this exhibition at The Erin Hanson Gallery in Los Angeles, October 1st – 28th. We hope you enjoy the vibrancy and beauty of this triumph of orange.